If you’re shopping for a ring, there’s a high chance you’re going to be wearing it frequently—maybe even every day for the rest of your life! It’s worth taking the time to figure out the ring size to ensure it remains secure and comfortable on your (or your partner’s) finger. If the ring is even a little too small, it can cause irritation and pain. It may be also difficult to remove, which is frustrating for the wearer and may cause damage to the ring. However, if the ring hangs too loose on the finger, it could slip off. As you can imagine, this is the surest way to lose an important and very valuable item of jewelry. Like Goldilocks, you want the ring size that’s “just right.” Let’s take a closer look at how to achieve that perfect size so that the ring will stay in place without bothering its wearer. 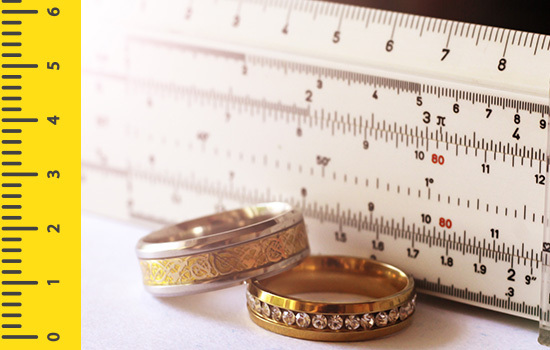 Rings are typically measured by their diameter in millimeters. A ring’s diameter in millimeters corresponds to a standardized ring size. Different countries use different ring size standards, which you can find and compare in this chart. In the United States, sizes are obtained by measuring the ring using a numeric scale based on quarters and half units. Standard U.S. ring sizes range from 3 to 13.5. The average ring size generally hovers around 6, corresponding to a ring diameter of 16.5 millimeters. Ultimately you’ll want to choose a ring size that corresponds most comfortably and securely to the wearer’s finger. That means you will have to measure the wearer’s finger in order to determine ring size. The ring finger is the digit between the long middle finger and the pinkie. If you’re buying a wedding or engagement ring, remember that these are usually worn on the left hand’s ring finger. The sizes of the left hand and right hand’s ring fingers may differ by a half size. The dominant hand’s ring finger is often slightly larger. Finger size can change due to a number of different factors such as time of day, temperature, illness, medications, fluctuations in weight, or frequency/intensity of exercise. Fingers tend to swell as the day progresses. Therefore, a ring measured based on a finger’s size early in the morning may become too tight as the day progresses. 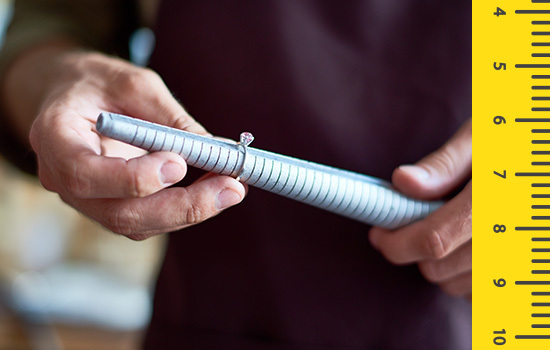 For most accurate results, take measurements at different times of day and when the finger is a different temperature. It may also be worthwhile to record a week’s or month’s worth of measurements to track the fluctuations. From these measurements, it should be possible to find an average finger size. By using an average, you increase the likelihood the ring will be comfortable to wear most of the time. 1. Ask for help from his/her close friends and/or family. These folks will likely prove to be your biggest allies in your mission for an ideal ring. They can help you "borrow" one of your partner's infrequently used rings for you to take to the jeweler or get your partner to reveal his/her ring size without being too obvious about it. The best part about including a friend or family in on the action is they can also help you decide what your partner would love to see on his/her hand. 2. If your partner currently wears any rings, wait until he/she takes it off at night, and then surreptitiously trace the ring's inside diameter on paper. You can use this measurement with a trusted jeweler to determine the proper size. 3. When your partner is asleep, tie a piece of string around his/her ring finger to ideal tightness. Then remove the string and measure its diameter. WARNING: Only attempt this strategy if your partner is a deep sleeper. Although the most important ring size measurement is the diameter, you will also need to choose the width of the ring. Unlike the ring’s diameter, you won’t need to worry as much about comfort or security. Instead, ring width is more a matter of taste and aesthetics. Like a ring’s diameter, ring width is measured in millimeters. Rings between two and three millimeters in width tend to look more thin and delicate. If you are planning on wearing your two rings on the same finger, ring width between one and two millimeters may be best for at least one of the two rings. That way, there is plenty of room for both rings below the knuckle. Rings with a width between three and four millimeters are the classic size preferred by most people who buy rings. This width also provides enough space to set a relatively large gem. If you choose a ring with a width between five and six millimeters, prepare for a big ring that makes a statement. This may be a great choice if your ring’s design contains a high level of detail or important engraving.